It has been one week since the one year anniversary of Occupy Wall Street, September 17, 2012. In celebration, let’s look at the movement through the lens of discard studies. My article, “Tactics of Waste, Dirt and Discard in the Occupy Movement“, has just appeared in Social Movement Studies: Journal of Social, Cultural and Political Protest (volume 11, no. 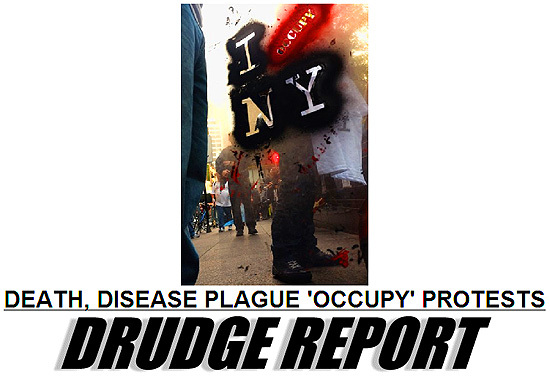 3) as part of a special edition on Occupy. The article will be a free download for the first two months after publication. 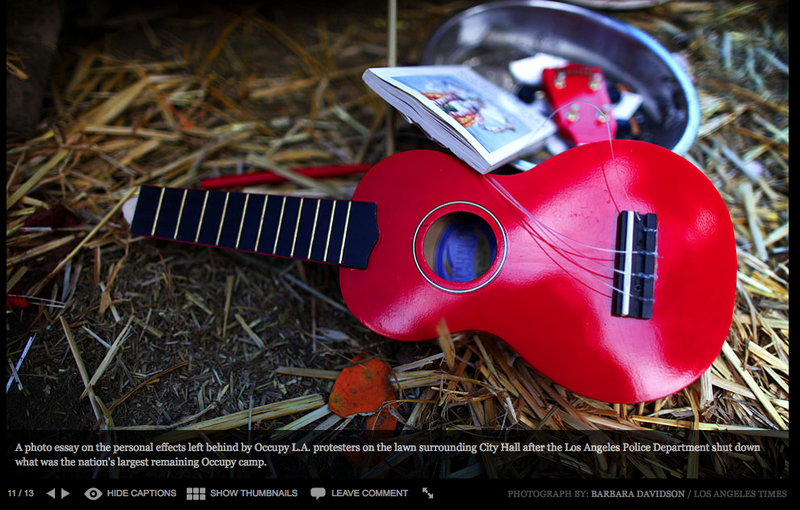 Originally, the article included a photo essay. In the spirit of Occupy, I sought Creative Commons permissions (CC-BY-NC) for photos that were not in the public domain or taken by news media– originally, the Occupy edition of the journal was going to be full open access. When they changed the terms to two months of open access, CC licenses were no longer valid. The current article has only three photos. Here is the entire photo essay of how trash and discards were used in Occupations all over the world, supplemented with excerpts from the original article. Note that some photos contain expletive and potentially offensive language and images. Both Occupiers and our opponents have used waste and discards—figuratively and literally—as strategies to create and cultivate a new social movement and ideals on one hand, and to maintain power and control over protesters on the other. 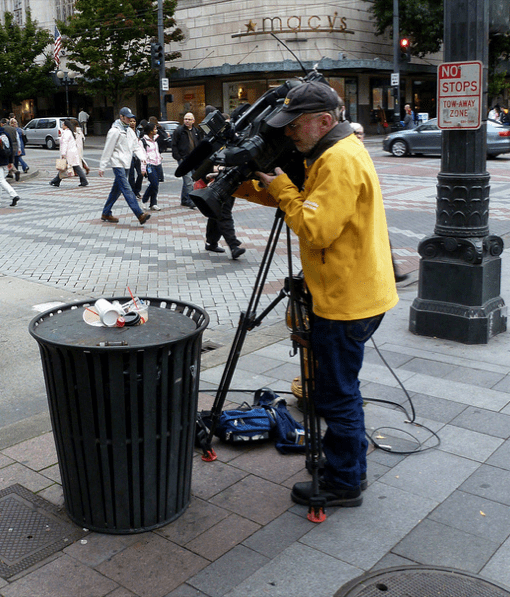 I will look at some specific roles trash, waste, filth and discards have played in tactical decisions by sides from the point of view of a New York City Occupier. The first section outlines how the New York City municipal government and its police have used their power to designate what is trash and what is not. 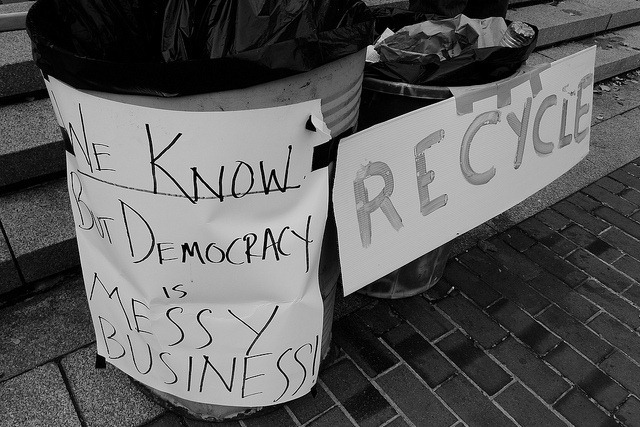 The second section considers several ways Occupiers have used waste to both protest an economic and political system that disenfranchises the public, as well as using trash as a platform to enact just citizenship and imagine a better future. In all cases, waste and trash are the materials through which larger contests of belonging and values are played out. Diagram art by Rachel Schragis in collaboration with Max Liboiron. 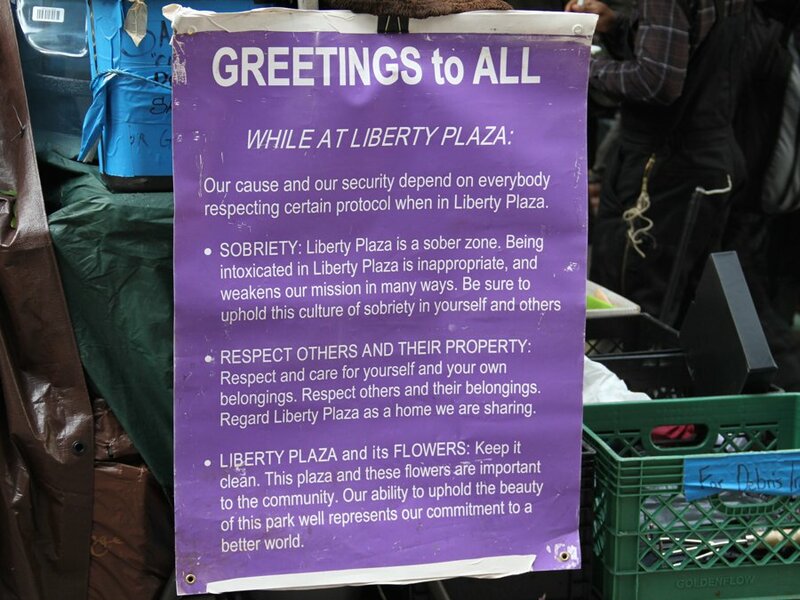 At around 1 am on November 15th, 2011, police came into a tented Liberty Plaza and began handing out fliers. The fliers said Occupiers had to leave the park or face arrest. Shortly after Occupiers ran from tent to tent to spread the news of pending eviction and arrest, police began tearing down tents and putting them in dumpsters…. No one could return to the park to gather their belongings. In the end, everything in the park– clothes, books, tents, medications, backpacks, laptops, kitchen supplies and food– were put into a garbage truck and transported to a city sanitation transfer station. 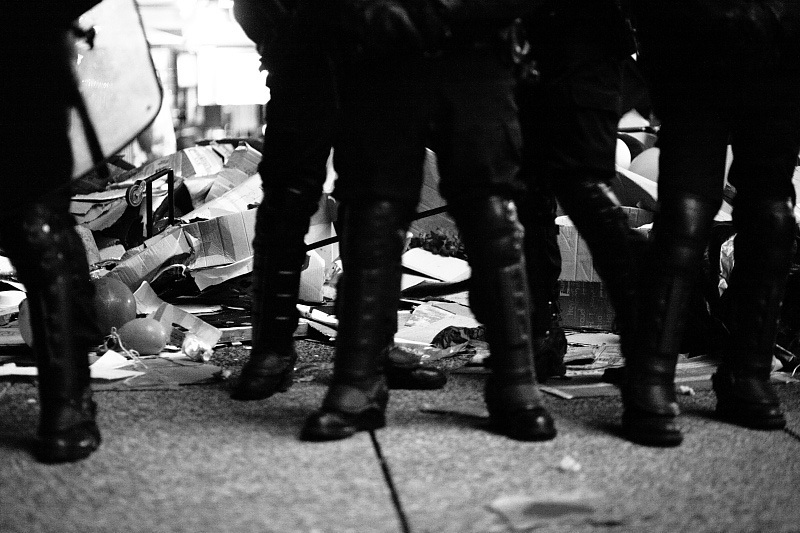 In New York City and in other occupations, taxonomies of trash were used as a conscious effort to restrict access to space and to define and discipline protesters. 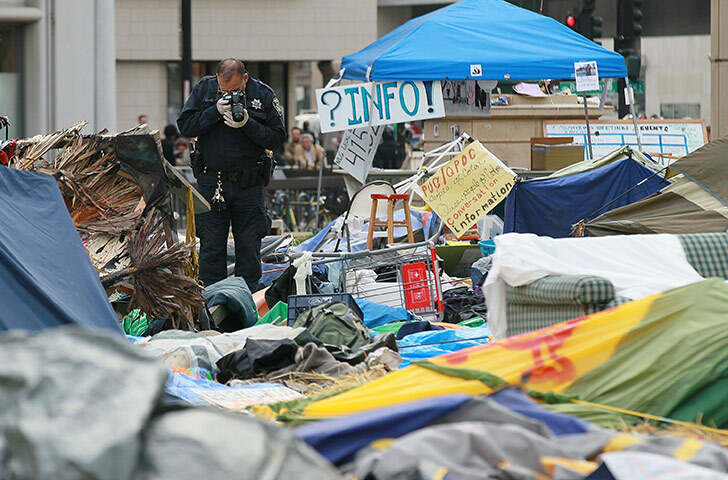 Over and over, in different evictions, city governments and police demonstrated their belief that political gatherings such as Occupy are dangerous in their filth, regardless of material sanitary conditions. As Mary Douglas so eloquently puts it, “As we know it, dirt is essentially disorder” (1966: 2). 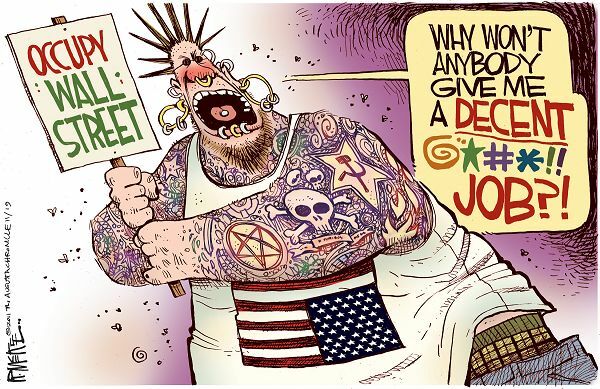 And in the eyes of those in power, the essential nature of Occupy is disorder. It is dirt. 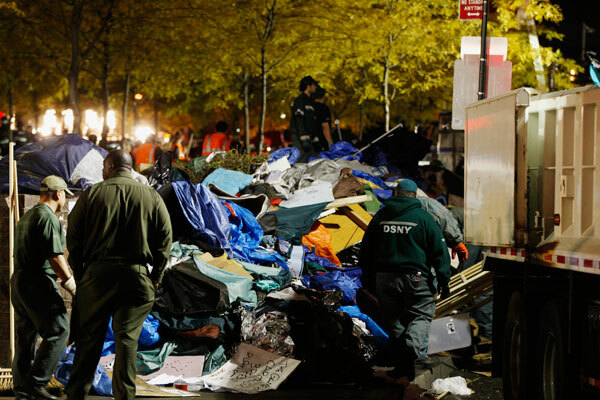 New York City Department of Sanitation putting the Occupy Wall Street encampment in the trash by order of Mayor Bloomberg, November 15, 2011. Photo by Lucas Jackson/Reuters. 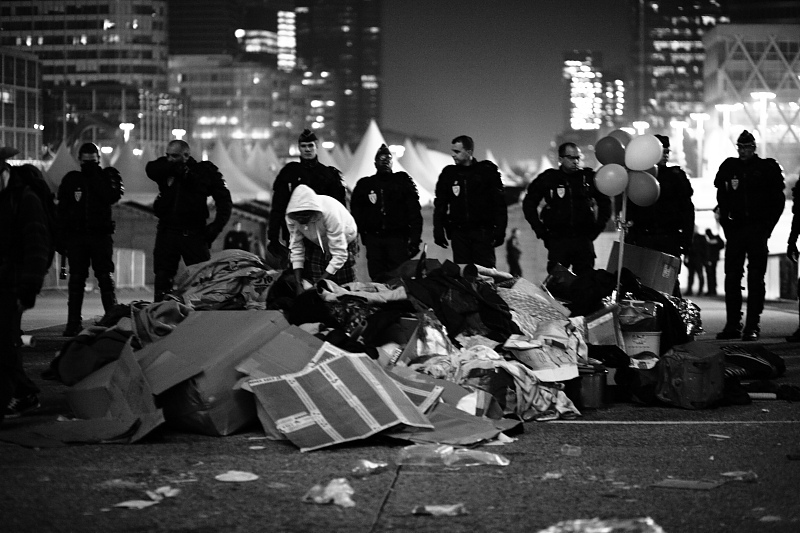 In Paris, police in riot gear attacked tents and then rigorously guarded the piles of trash they made. November 15, 2011. Photo by Sebastien Gabriel Meriadeck. Occupy Paris eviction. November 15, 2011. Photo by Sebastien Gabriel Meriadeck. Occupy Los Angeles eviction, November 30, 2011. 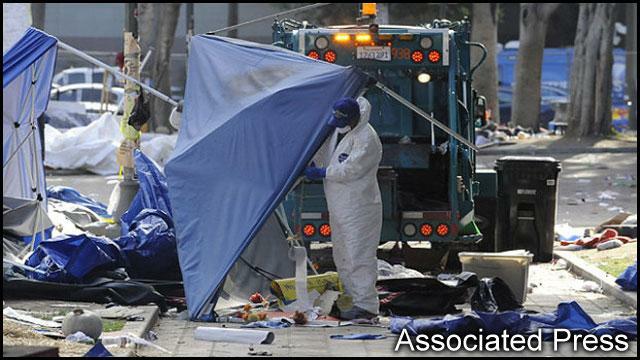 In LA, the sanitation workers wore Hazmat (Hazardous Material) suits, indicating that Occupy and Occupiers constituted a special category of trash that was especially dangerous and toxic. Photo AP. 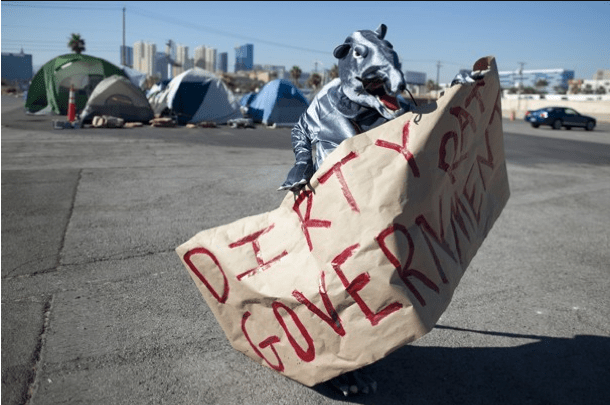 Occupy LA eviction, November 30, 2011. Photo by International News. Occupy Melbourne in Australia. November 21, 2011. Photo by Setsysha. 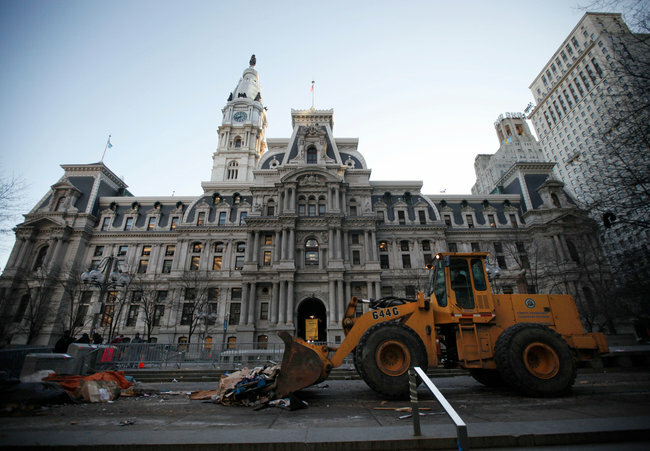 Occupy Philly eviction. November 30, 2011. Photo by Matt Rourke/AP. Oakland police officer takes photos after they dismantle and begin to throw away Occupy Oakland encampment. November 20, 2011. Photo by Mr. Lick. 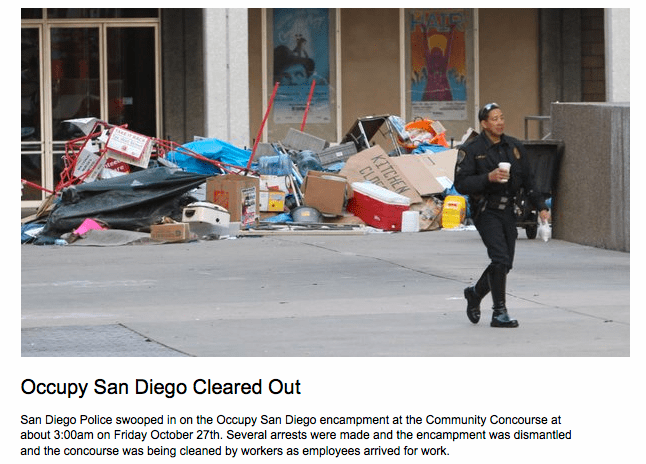 Occupy San Diego, evicted October 28, 2011. Photograph and original caption from the Union Tribune. Occupy Toronto being loaded into municipal sanitation trucks on November 23, 2011, with two protesters in the foreground. Photo by Ian Williams. 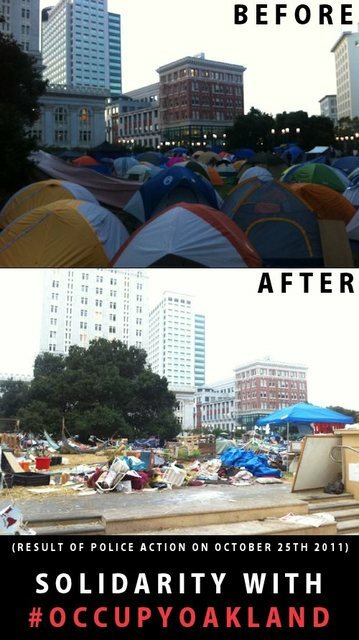 Call for solidarity for Occupy Oakland using a before and after comparison of tactics of waste by Oakland PD. These images may seem exhaustive, even redundant. But that is the point: across the world, from New York to Paris to Melbourne, designating entire encampments as trash was a common tactic of municipal governments and their police forces. The ability to designate, and then forcibly treat, another group’s possessions as trash is a show of power, and is particularly ideological in nature.This is just not a case of clearing areas as efficiently as possible. Even objects of obvious worth, such as libraries, laptops, backpacks, and kitchen supplies, were indiscriminately trashed. 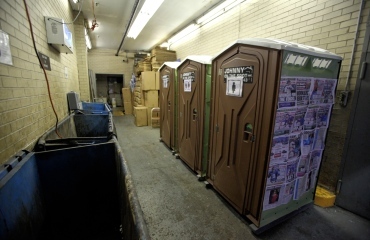 In the days after the New York City eviction, some Occupiers went to retrieve their belongings from the Sanitation station where police said they were “storing” them. The hundreds of books from the People’s Library were of particular concern. The books and other belongings had been compacted in the truck and dumped to the concrete floor, effectively destroying them. They had clearly been subject to identical treatment as regular trash. Four laptops from the People’s Library available to be picked up from the Sanitation department the day after the eviction. Photo from the OWS People’s Library. 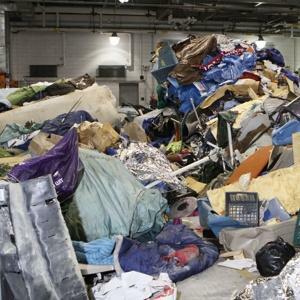 This photo appeared in a right-wing publication under the caption “Disgusting OWS filth.” It is of the sanitation transfer station where belongings were unloaded from sanitation trucks in piles mimicking trash. It is an example of how tactics of trash reinforce rhetorics of trashiness, which in turn justify further tactics of trash. 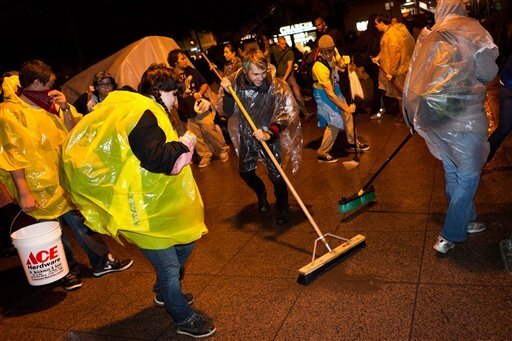 Not only do the Mayor’s office, police and dominant media control the terms of public conversations about Occupy in terms of sanitation so Occupiers have to constantly demonstrate their cleanliness in public, but more importantly, such derogatory symbolism rests on a binary: clean and dirty, safe and dangerous, us and them. 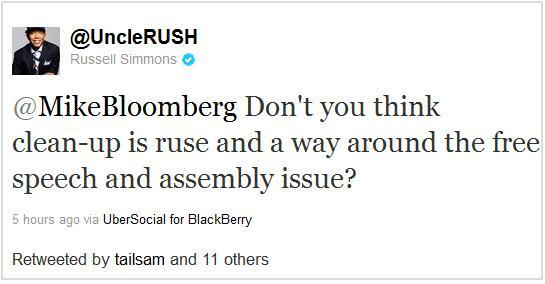 This is the contest between Bloomberg and his police, and New York City Occupiers. The Mayor and police work to make the Occupiers Other, and Occupiers strive to exercise their rights as citizens to assemble and protest. This contest is often fought in terms of filth and waste. 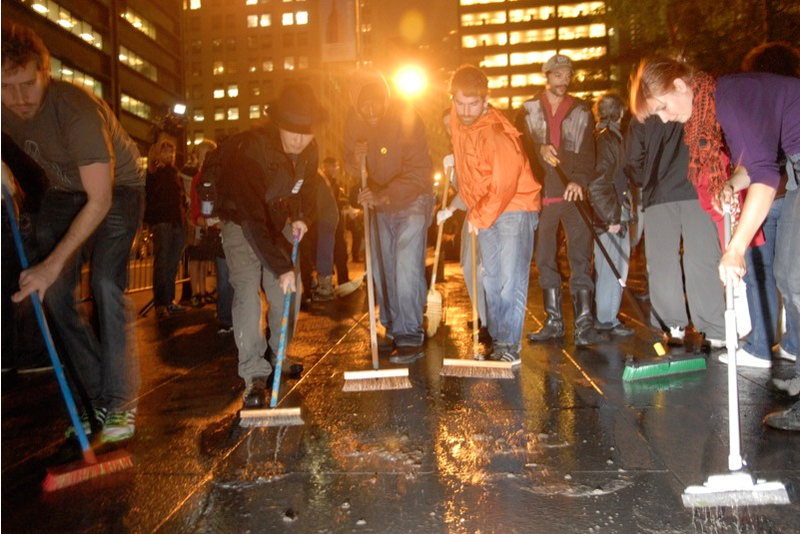 New York City Occupiers cleaning Zucotti Park to fend off a sanitation eviction by Mayor Bloomberg. October 14, 2011. Photo by John Minchillo/AP. 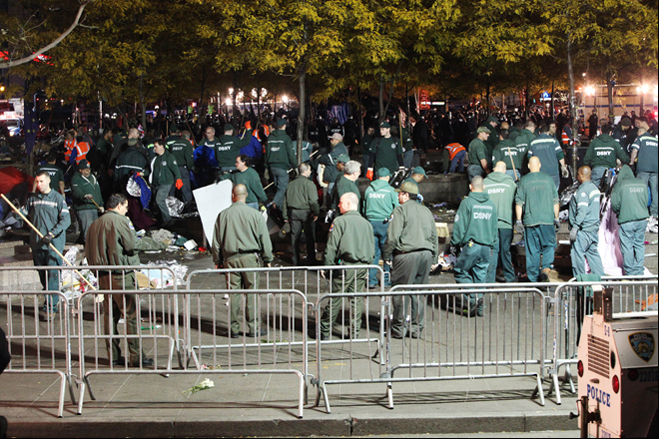 Another photo from the emergency clean up of Zucotti Park on October 13, 2011. Photo by Stephanie Keith. 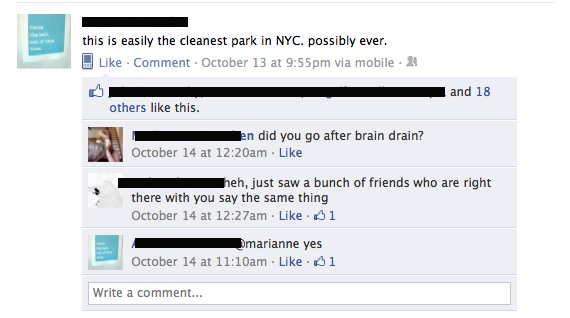 A Facebook update from the park cleaning. 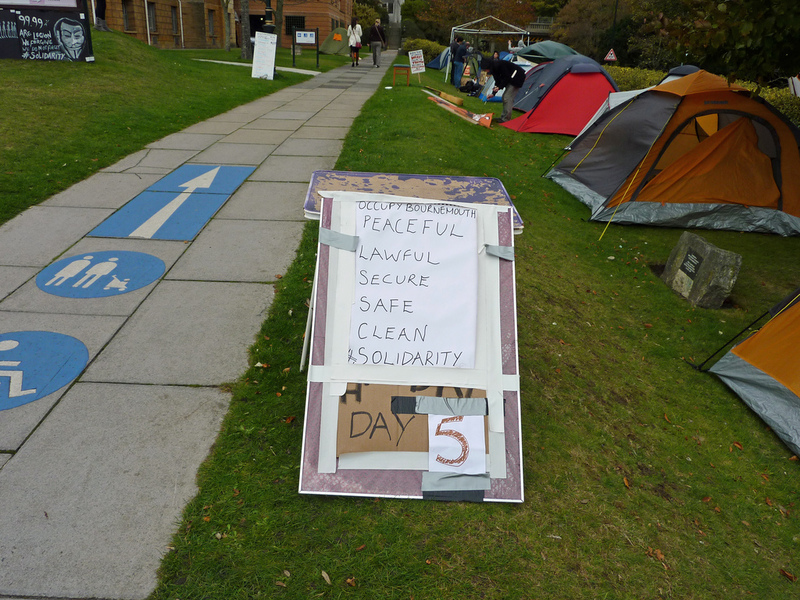 Occupiers stayed all night, and in the early hours of the morning, they received notice that the park would not be evicted for a clean up. Tactics of making waste and trash out of the belongings and encampments of Occupiers did not stop at the material level. As many Occupiers know, the mainstream media, municipal governments and the police also used filth rhetorically to classify Occupy. Photo by Occupy Seattle member DGH. October 7, 2011. 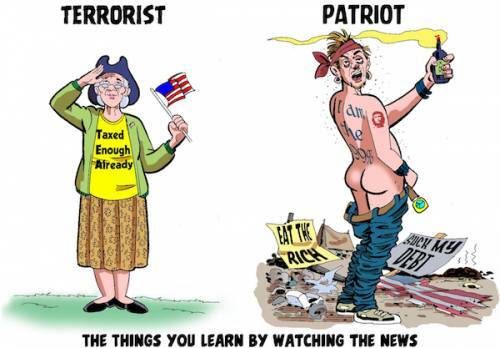 The website header of a right-wing blog. Page from a New York newspaper. A headline reporting on a lack of “smell of urine or feces.” An example of how those in power set the terms of debate, so Occupiers had to constantly prove they are clean, and reporters looked for signs of uncleanliness. As the images above attest, slippage between moral and material filth is foundational to anti-Occupy rhetoric. Many of the images are drawings, cartoons, or illustrations rather than documentary photographs, which highlights the role of filth in the popular or opposition’s imagination. The contest of filth and belonging is not new. The recorded history of those in power seeing threats to their social order as “filth” stretches as far back as medieval times. More recently, Ezra Pound’s Cantos regarded “the multitudes in the ooze,” citizens and their political leaders, as a flood of excreta, with democracy as a sea of swampy sewage. In contrast, Pound’s description of his desired enlightened dictator was neat and tidy, even shinning. In the last three centuries, the rhetoric of waste has usually been class-based, where the bourgeois “[condemns] the excremental working classes,” a pattern suited to a movement protesting the yawning gap between the rich and poor (Inglis 2010: 216). In every recorded case described by Inglis, filth and waste are used to describe the inferior, unregulated, disorderly and dangerous Other that pose some threat to the system of rule. 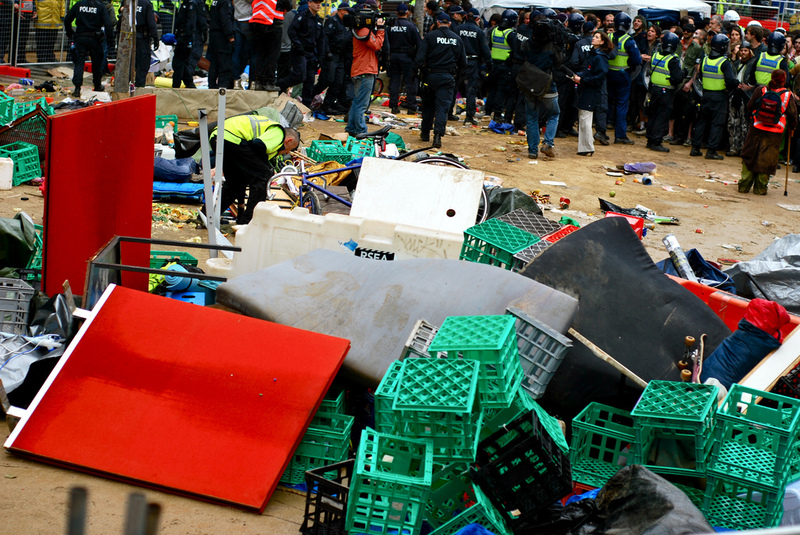 Within this understanding of the role of waste in protest, the seemingly contradictory acts of Bloomberg, the police, and other opponents to Occupy whereby they decry waste even as they create waste by turning entire encampments into trash make sense. They are methods to define and control what they see as dangerous disorder, specifically a danger to dominant social order. These are exercises in classing protesters as non-citizens. As Them. As Other. As Trash and Dirt. One of the unique aspects of the Occupy movement compared to similar movements is the encampments. In these densely populated impromptu urban settlements, perfect strangers have to live together. In this context, ideals for how the world should work must be put into practice on the ground. First and foremost, there must be toilets. There were hundreds, even thousands of people at Liberty Plaza on any given day before and after the eviction, and few accessible toilets in nearby businesses. 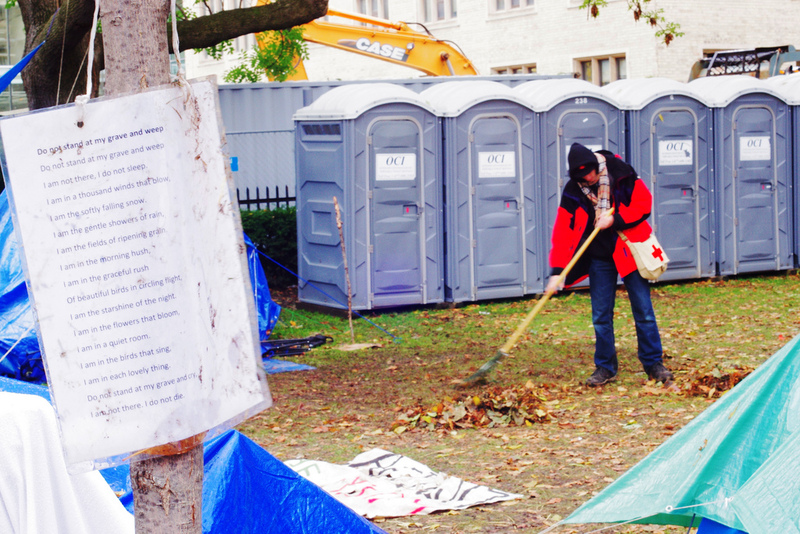 Protesters had to figure out a way to rent, pay for, and site sani-potties. In New York, this meant an alliance with the United Federation of Teachers’ to place the sani-potties in the union’s loading dock. 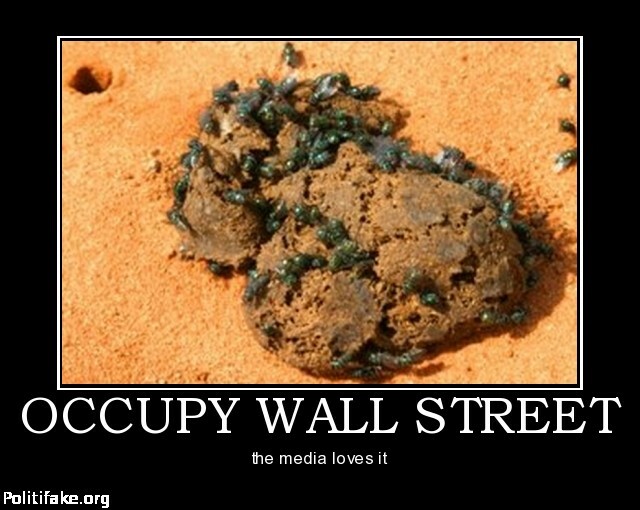 The UFT’s president said, “we are happy to help Occupy Wall Street to continue to be a good neighbor.” There was also a laundry service at Liberty, recycling stations, and, of course, the Sanitation Working Group, a facet of every Occupy encampment around the world. OWS potties at 52 Broadway. November 5, 2011. Photo by the Daily News. Porta potties at Occupy Toronto. October 27th, 2011. Photograph by Martin Reis. Porta potties often doubled as a bulletin board in many Occupations, since everyone was likely to visit them throughout the day. It was one of the main sites eviction notices were posted in London (UK) and Toronto (Canada). 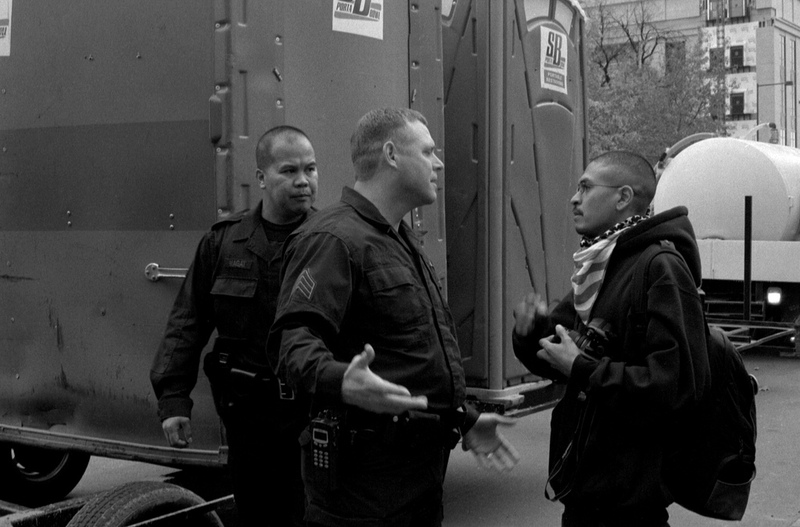 Law enforcement officers explain to Occupy Denver demonstrators that portable toilets placed in Civic Center during the morning’s Veteran’s Day Parade must be removed by sanitation crews-11-8-11 Photo by Dan Schneirder. 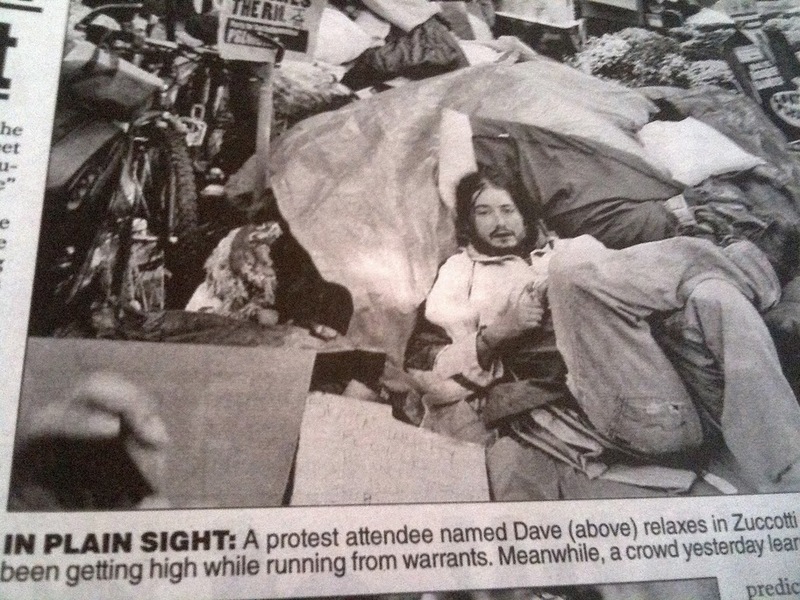 A humorous meme circulated online about heroic efforts of OWS to meet the basic needs of the encampment. 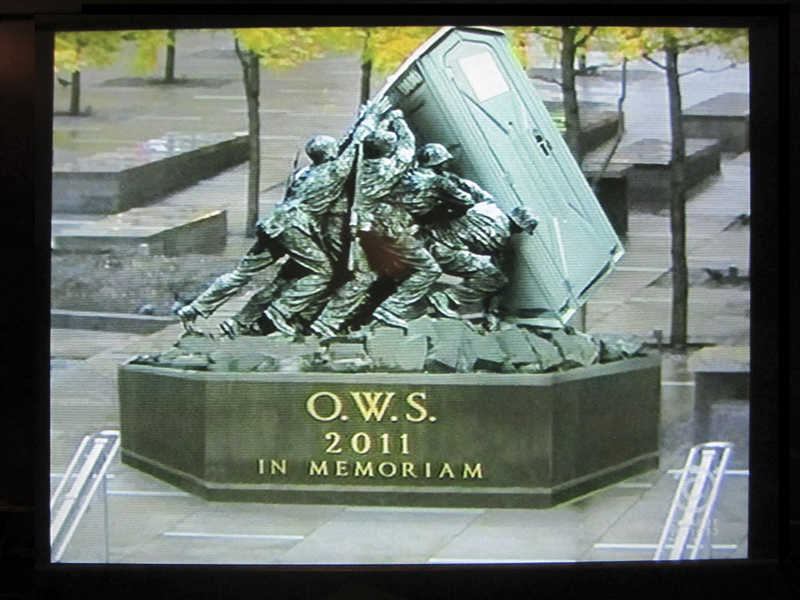 It is unclear whether it is a tongue in cheek celebration or criticism of OWS, though, a week after the one year anniversary of OWS, we can see that the In memorandum date is a bit off. 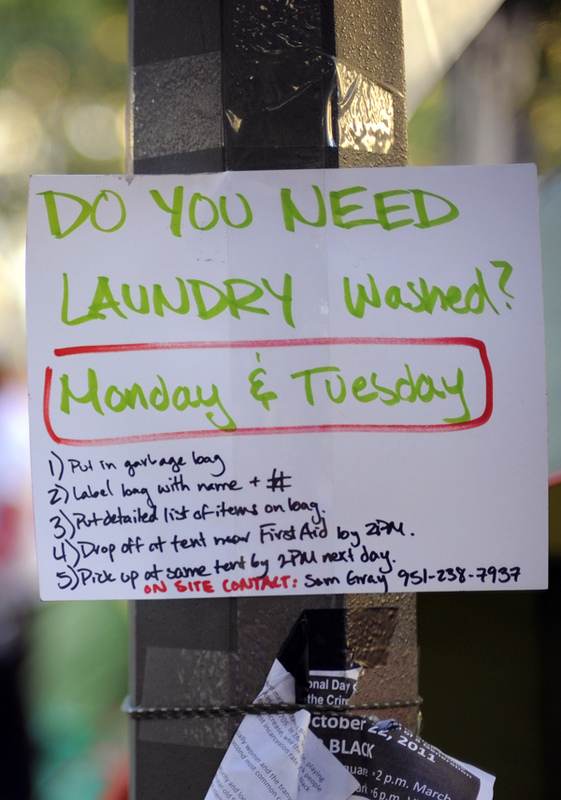 Laundry sign at Occupy LA. October 18, 2011. Photo by Tom Andrews. 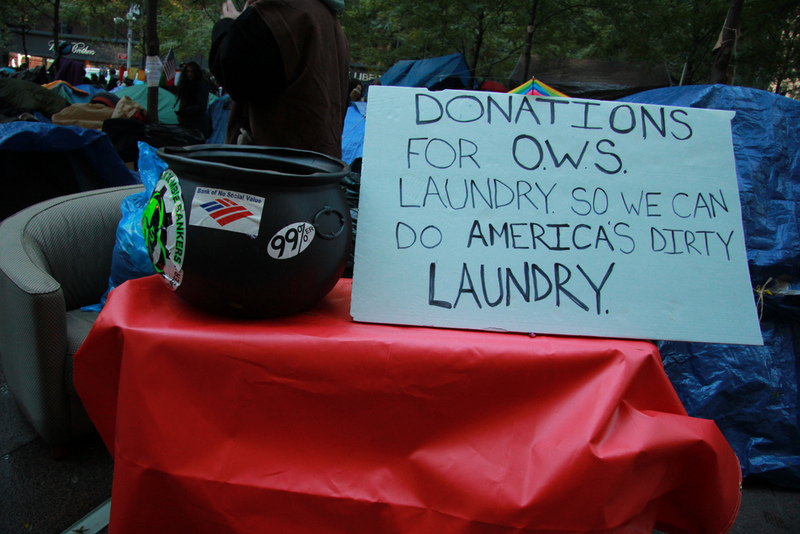 Laundry donation sign at OWS. October 30, 2011. Photo from Microcosmologist. Much of the money for laundry came from the GA (General Assembly), where decisions about laundry logistics were reached by consensus. In the future I hope to do a post about how, exactly, laundry happens by consensus. There are piles of laundry in plastic bags in the background. Many news sources erroneously labeled the laundry piles as trash piles in photos in the popular press, mistaking cleaning up for more signs of dirt. A sign at Occupy Toronto. Nov 4, 2011. Photo by Alexa Clark. 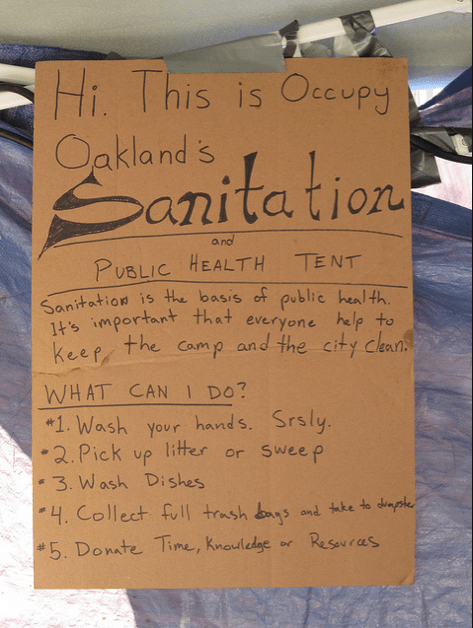 Sanitation working group HQ at Occupy Oakland. Nov 6, 2011. Photo By Anka Karewicz. 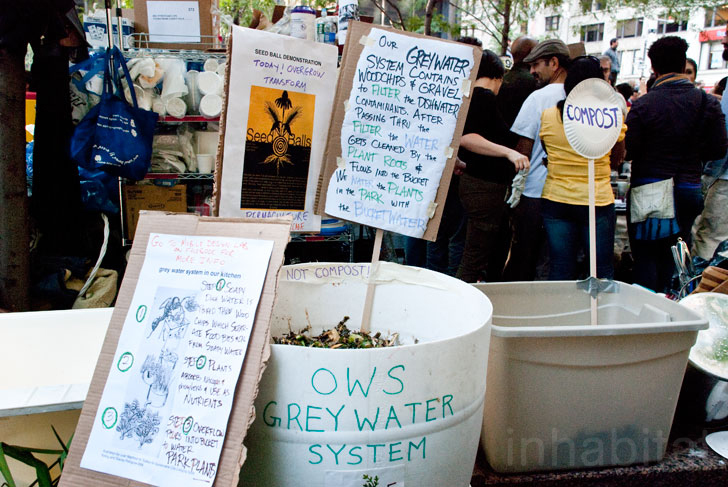 OWS in New York City nicknamed their Sanitation area after the city’s Sanitation Department. Nov 18, 2011. Photo from AM New York. A sign above the People’s Library in New York City asks Occupiers to thank those in the sanitation working group. October 21, 2011. Photo by Marry Solow. The Good Neighbor Policy at Occupy Wall Street, NYC. These rules were created and agreed upon by consensus at a General Assembly of over one hundred Occupiers. They set up the guidelines for good citizenship, often overtly in terms of cleanliness and order, within the encampment: “Keep it clean. This palza and these flowers are important to the community. Our ability to uphold the beauty of this park well represents our commitment to a better world.” Photo by the author. A tiny sign in one of Liberty Park’s three flower gardens. October 18, 2011. Photo by Brian Gilbreath. Sign at Occupy Bournemouth (UK). November 2, 2011. Photo by Dawn Verdaguer. Sign on a dumpster at OWS. n.d. Photo by Julie Shapiro at DNAinfo. Protest sign at OWS. October 13, 2011. Photo by Neil Girlling @ theblight.net. 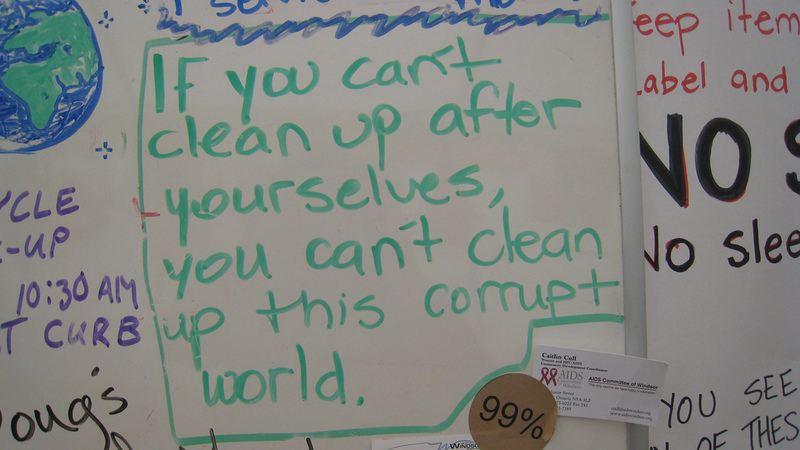 A note on the Sanitation white board, OWS. Nov 12, 2011. Photo by Mita Williams. A sign from Occupy Delaware. n.d. Photo credit TC Davis. 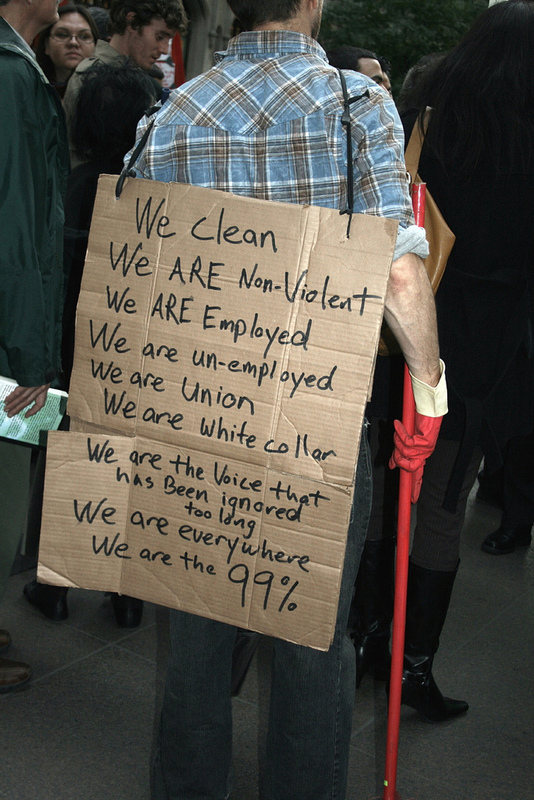 The first statement on a sign describing who OWS is: “We clean.” October 18, 2001. Photo by Silvershoots. 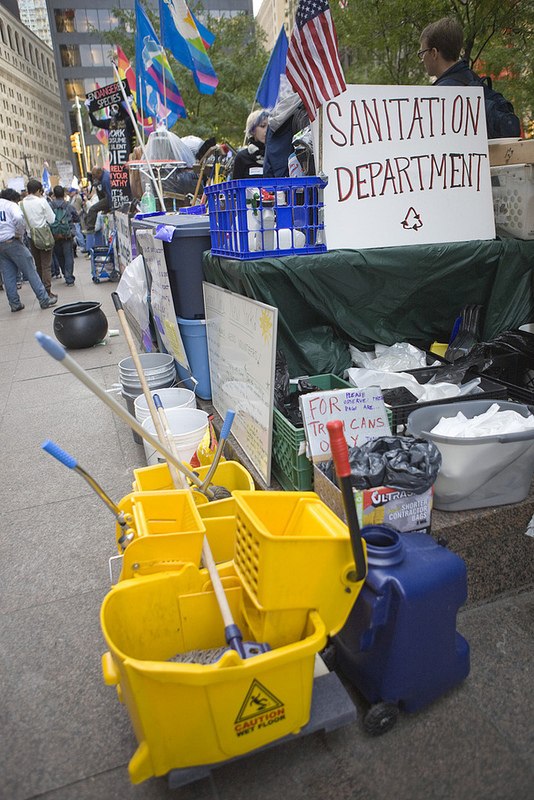 Not only was basic maintenance part of the citizenship-building process of the Zucotti encampment, dirt, trash and discards were also used as the raw material to imagine a better world. 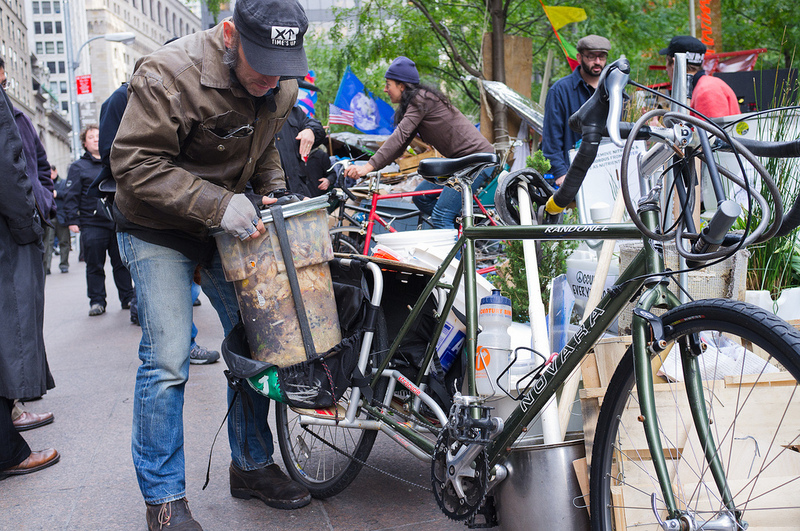 At the height of the encampment, Zucotti boasted a grey water system as part of the People’s Kitchen, a bike-powered composter whose compost was cycled to several nearby community gardens, a recycling depot, and a reuse station to fuel the movement’s cardboard aesthetic. These environmental amenities, constructed from scratch for public use, were a concrete manifestation of the better world Occupiers seek. In this better world, waste and trash were a thing of the past, as citizens’ duties included using resources as fully as possible. In many conversations, prolific waste was seen as a necessary product of exploitative capitalist production. The greywater system was one of the most photographed features of Liberty Park. The system contained wood chips and gravel to filter dishwater used in the People’s Kitchen. After passing through this first filter, water is cleaned by the plant roots and gravel before flowing into a bucket. The water was then used to water the park plants. A sign explained the system, and members of the sustainability working group were on hand to explain the system to tourists and Occupiers. n.d. Photo by Amanda Silvana Coen for Inhabitat. The People’s Kitchen an Liberty Park also had a compost system. Food waste was separated from regular trash and delivered to NYC community gardens twice a day. This volunteer is loading his bike with two compost containers on the 3:30 run. Oct 31, 2011. Photo by Mat McDermott. Most occupations around the world had a recycling center in addition to trash collection, and many also had composting, which Occupiers usually had to manage themselves in the absence of city infrastructure. 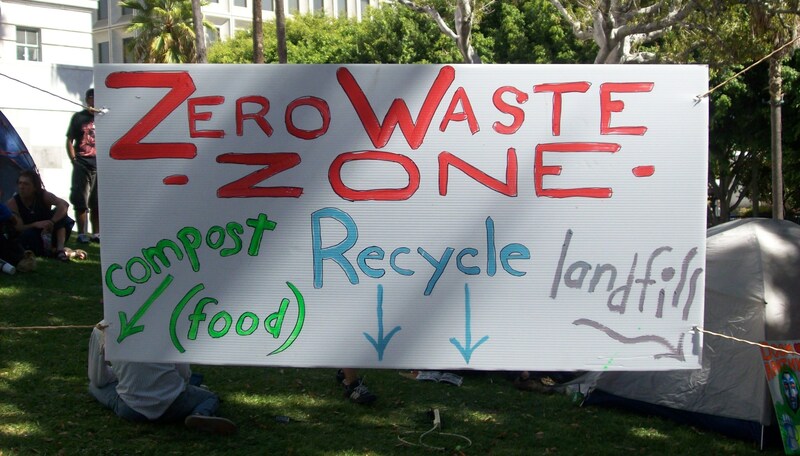 Some Occupations, such as Occupy LA, advocated for Zero Waste measures. October 16, 2011. Photo by Rick Panna. Together, the rhetorics and actions of cleaning up and building a wasteless future come to bear directly on Occupy’s message for just citizenship from 100% of society. Not only is littering and leaving messes for others to clean a breach of citizenship in the park, it is also an ethical breach in politics and finance. 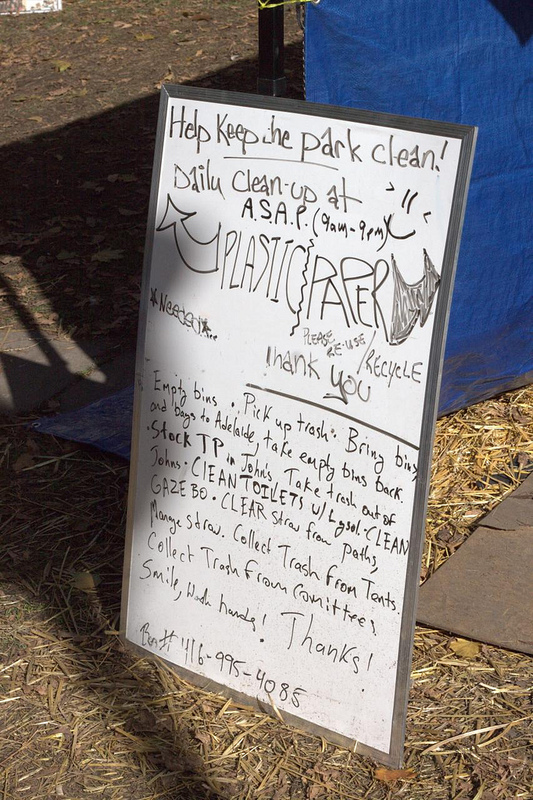 Not only is wasting, trashing, and discarding an undesirable act in the park, it is also undesirable and intolerable from institutions outside of the park. Wall Street is a notoriously bad housekeeper. 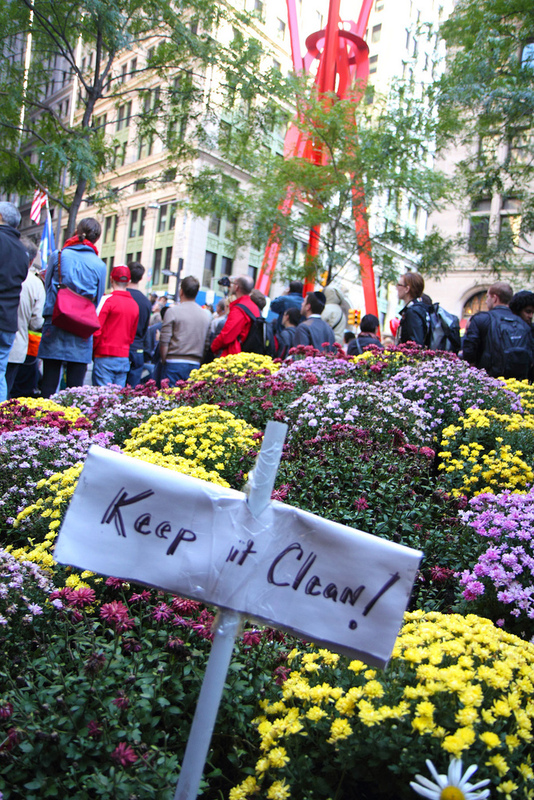 It is worth noting that after the eviction of Zucotti, the “ethics of doing your chores” continued as the Sanitation Working Group cleaned foreclosed houses for reoccupation, and cleanliness continues to be a goal in meetings and other shared spaces within Occupy, though in different forms. 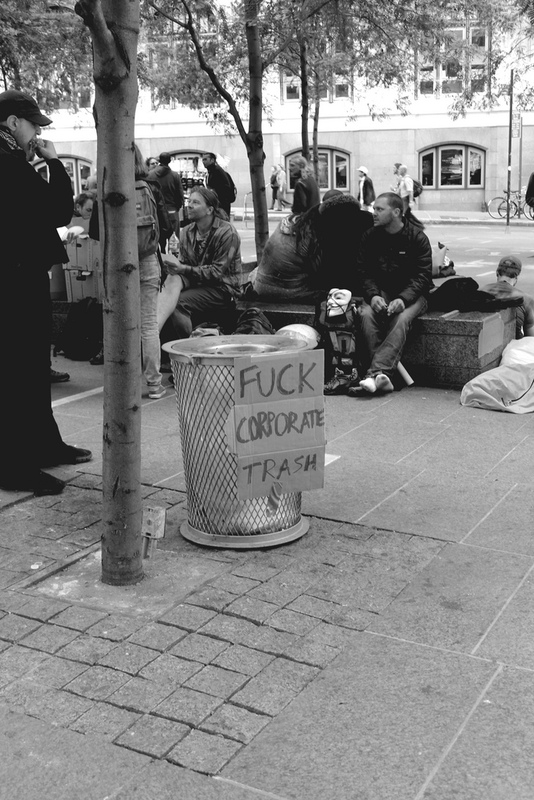 A second way that trash, dirt and waste plays into the tactics of Occupy is the argument that things that ought not be discarded have been wasted and trashed by the wealthiest 1% of society, banks, governments, and corporations. 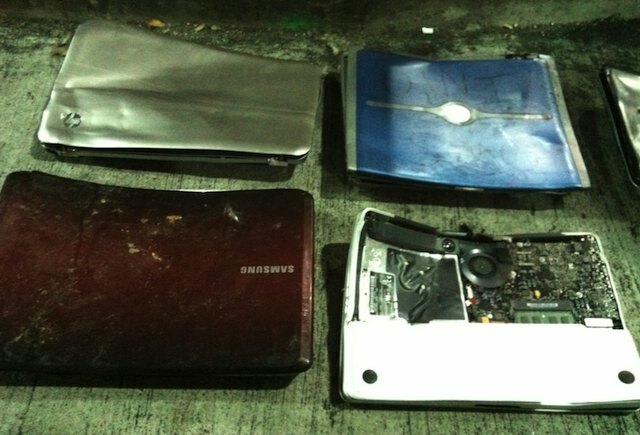 Many Occupiers involved in the eviction of Zucotti whose belongings were “stored” in dump trucks carry their crushed laptops to public gatherings as artifacts of injustice. 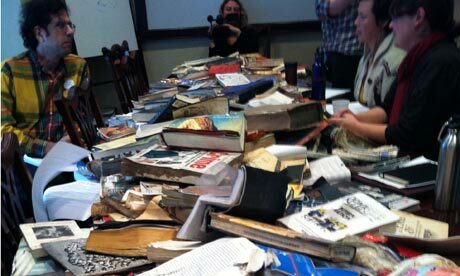 The People’s Library called a press conference after the eviction and piled hundreds of trashed books in front of reporters to demonstrate the intolerable politics of trash practiced by Bloomberg and the police. Members of the People’s Library and their lawyer call a press conference days after the eviction of OWS showing the mistreatment of books. Photo by Karen McVeigh for the Guardian. The same tactics are also used in a more symbolic sense. Members of Occupy Student Debt donned graduation caps and gowns made of garbage bags to symbolize how their degrees and earning power after graduation were worthless under the weight of their debt. Occupy Museums built a miniature model of a house in Harlem threatened with foreclosure out of discards and presented it to the Museum of American Finance, asking that the depreciated status of the property be ensconced in an elite cultural institution as part of the master narrative of how American Finance affects everyday people. Various testimonials on the “I am the 99%” tumblr site make reference to how their lives, futures, or degrees are “going to waste” or “being wasted” because of the corruption and inadequacies of institutions meant to support them. In each case, the rhetoric of waste, trash, filth and discards are used to critique the disproportionate power of a minority to discard the rights and livelihoods of the 99%. There is an implicit argument here that a citizen or resident of the United States should not be treated like trash by definition of what it means to be an enfranchised person. Members of Occupy Student Debt, now Strike Debt, wearing graduation gowns made of trash bags to symbolize their worthless degrees in the face of insurmountable student debts. Nov 21, 2011. Photo by the author. Cardboard model of the building at 477 West 142 Street in Harlem delivered to the Museum of American Finance by Occupy Museums and Occupy 477. 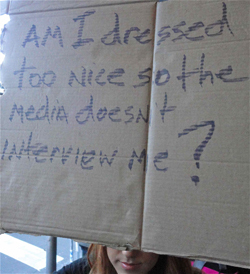 The cardboard aesthetic of Occupy is based on the democratic accessibility to the material, as well as an ode to the power of everyday people and materials. In this case, the cardboard is also a testament to the undervalued nature of the 477 property, and the desire to have a cheap, everyday cardboard object–a people’s object–represented in an elite institution on Wall Street. December 7, 2011. Photo by the author. Waste testimony: “I hate that my talents are going to waste.” From the We are the 99% tumblr site. Like their opposition, Occupiers also use the rhetoric of dirt, filth, waste and uncleanliness to characterize corrupt governments, the financialization of governance, and the corporate priority of profit over good citizenship. 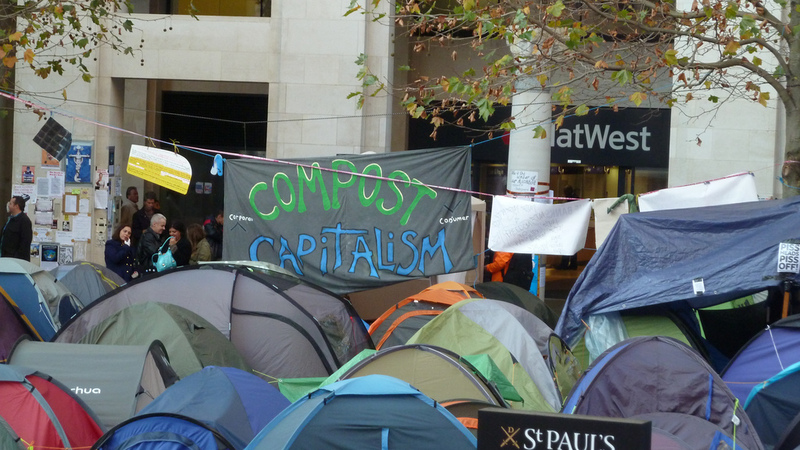 The London encampment sported a much-photographed sign reading “Compost Capitalism.” A direct action from OWS involved scrubbing Wall Street with brooms to “clean up” Wall Street. 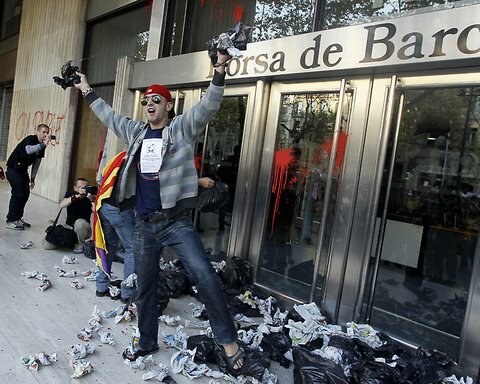 Protesters threw garbage at the Barcelona Stock Exchange. Compost Capitalism sign at Occupy London. Nov 18, 2011. Photo from Permaculture. Occupiers scrubbing sidewalks in the financial district of New York City on their way to the Trump Building and other “dirty” locations. November 2, 2011. Don Emmert, APF, for MSN. Halloween in NYC. October 31, 2011. Photo from The Other Bolena. 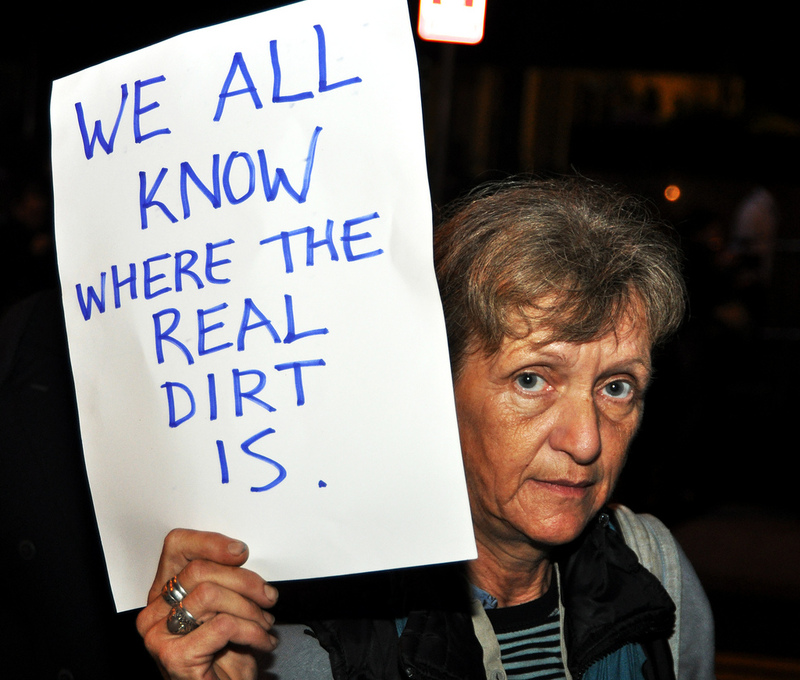 Protest sign: “We all know where the real dirt is.” October 14, 2011. Photo by Mike Fleshman. A sign from Occupy Las Vegas. Nov 15, 2011. Photo by Julie Jacobson. 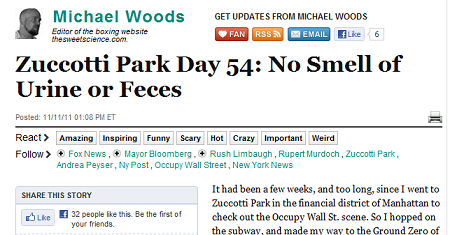 One of the less subtle protest signs at Liberty Park on the second day of Occupy Wall Street. September 18, 2011. Photo by Walshe. 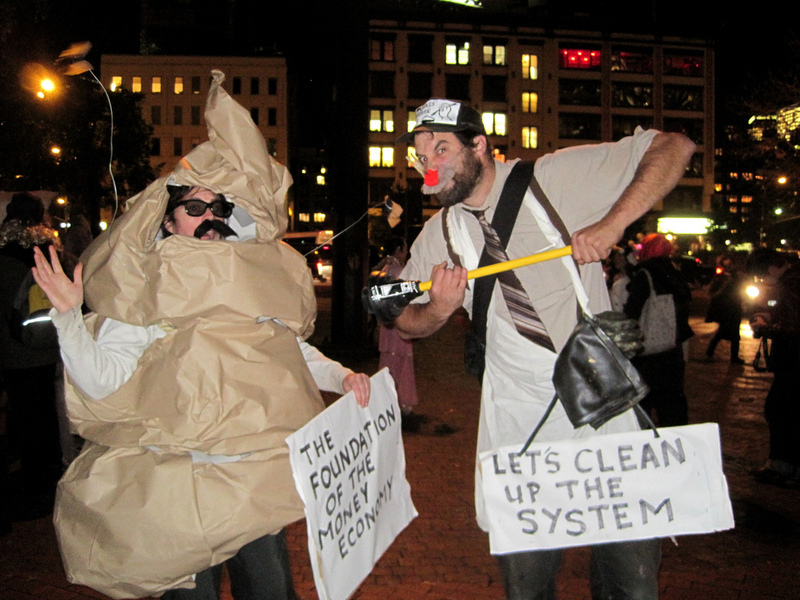 In conclusion, to focus on the physical and material aspects of dirt and trash within Occupy or to keep a tally chart of when and where trash appears and whether or not it actually carried dangers of tuberculosis as some media claimed is to miss the point of the roles of waste, discard, dirt and filth within the movement. Instead, we must focus on the different logics of transgression attendant to waste and dirt. We can see that ideas about filth, waste, and transgressions make up an ongoing political debate about the ideal society by both Occupiers and its opposition. 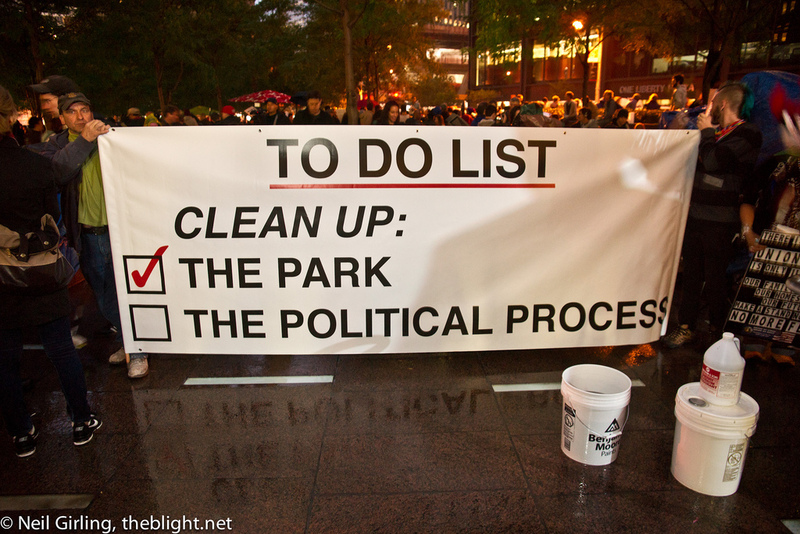 While many new tactics that use trash and filth to argue for or against certain types of order have been innovated on both sides of the Occupy movement, these are the terms over which contests about what counts as tolerable and intolerable conditions, right and wrong, citizenship and the Other, acceptable and unacceptable behavior and what constitutes “out of placeness” have been waged for centuries, and will continue to be waged. Douglas, M. (1984). Purity and Danger: An Analysis of Concepts of Pollution and Taboo. London, Ark Paperbacks. Inglis, D. (2011). “Dirt and denigration: The faecal imagery and rhetrocs of abuse.” Postcolonial Studies 16(39): 207-221. This article was written by Max Liboiron, New York University, and edited by three members of Occupy Wall Street who wish to remain anonymous. This entry was posted in Activism, Government, Justice (EJ), Sanitation, Urban, Waste, Wastefullness and tagged Bloomberg, citizenry, compst, dirt, discards, disorder, eviction, exclusion, filth, garbage, greywater, ideal society, occupy wall street, othering, ows, photo essay, police, power, protest, rhetoric, Sanitation, social movements, tactics. Bookmark the permalink. What a great piece — fascinating and surprising. Thanks for it! Thank you for your interest! I appreciate the comment. Thank you for these illustrations – so much is explained here. “These are exercises in classfying protestors as non-citizens. As Them. As Other. As Trash and Dirt”. As always, the best disinfectant remains daylight! Reblogged this on Oil Slave.